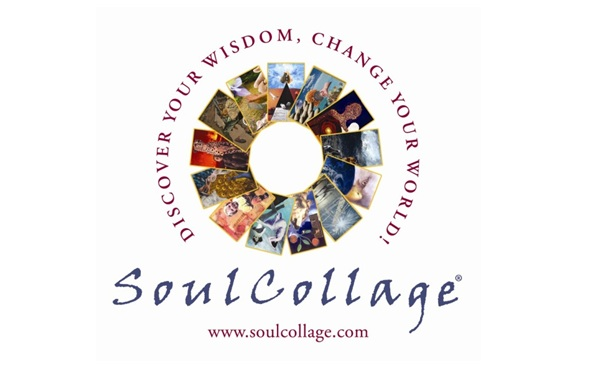 I facilitate a process of personal exploration called SoulCollage®, in which you (the creator!) make a deck of wisdom cards for yourself — one by one. No art experience is required! I provide orientation to newcomers. We meet as a group, and each participant is free to let go of thinking and story, allowing her eyes to lead her to images that feel interesting. These images are trimmed and arranged on a mat board and then glued. When the session ends, we gather to share our cards; we meet that part of ourselves and hear its wisdom using a series of simple questions. The experience of being in a room full of people quietly working in the flow of creativity can be deeply heart-satisfying. It is also fun! 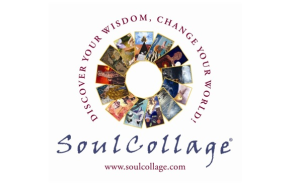 SoulCollage® Salons are generally 3-4 hours long and cost $15-20 per person. All supplies are included. To arrange a salon, please contact me at kathryn@pobox.com, or call 408-829-3319. You can also look at the SoulCollage® Salon Meetup calendar to see upcoming salons. Explore the cards I’ve created by clicking on the categories below. Transpersonal Cards: Connection with a place of Spirit, a place of knowing Oneness as a container of your Many. Committee Cards: Our many inner personality parts, our ego, our character. Council Cards: The archetypes who guide and challenge us personally, and who are active also in the collective consciousness of the planet. Community Cards: Our guiding sentient beings, teachers, loved ones, pets, even places. Companion Cards: Animal guides imagined in our body’s energy centers. You can also purchase the book by Seena Frost, SoulCollage® Evolving: An Intuitive Collage Process for Self-Discovery and Community.